Cunard’s Queen Mary 2 is the only modern-day ocean liner in the world. Photo courtesy of Cunard Line. The Queen of England did the honors at the naming ceremony and fanfare and fireworks greeted her at her first arrival into nearly every port – the 151,400-ton Queen Mary 2, or QM2 as she is affectionately known, took the cruise industry by storm when she was launched back in 2004 and still turns heads to this day. 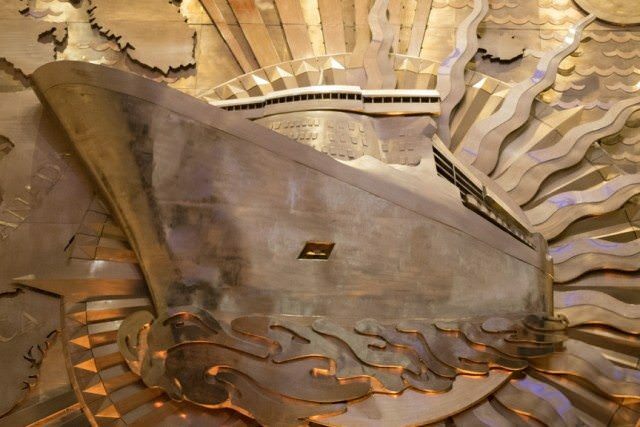 The gracious old-world QM2 is considered the only real ocean liner built since Cunard’s QE2 debuted in 1969, with antiques, memorabilia and artwork reflecting this legacy. 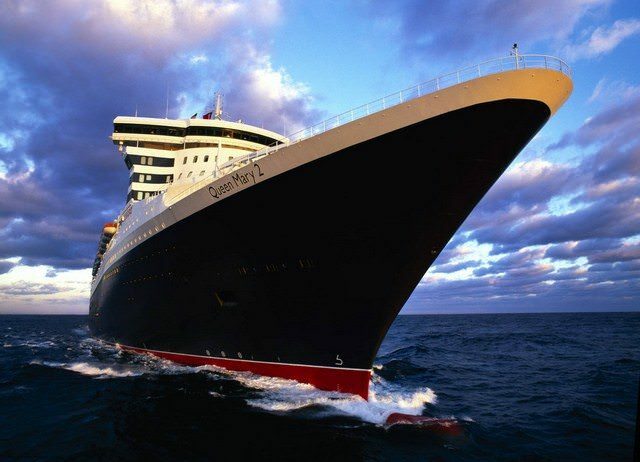 QM2’s long and lovely black and red hull and her razor-sharp prow able to slice through open-ocean waves are a sight to behold in this age of boxy white behemoths. 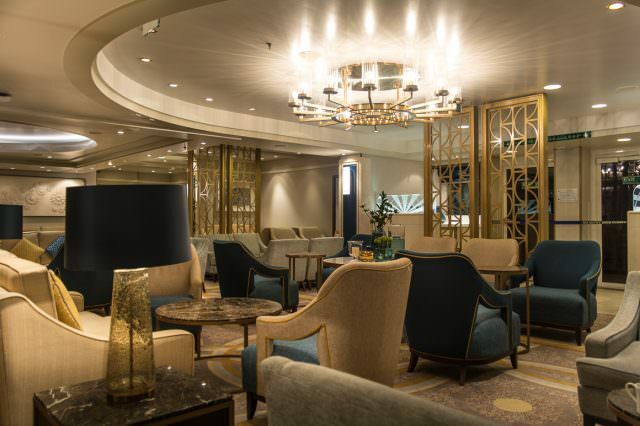 In late 2011, QM2 underwent a major refurbishment that refreshed her staterooms and public areas, offering new color schemes and redesigned spaces like the popular Golden Lion Pub. 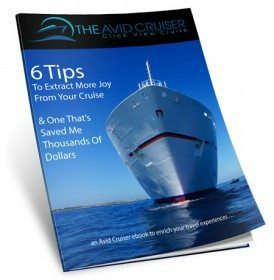 In 2016, she underwent her largest transformation to-date, adding new solo staterooms, new lounges and updated dining venues, and refreshing all staterooms and public spaces from stem-to-stern. 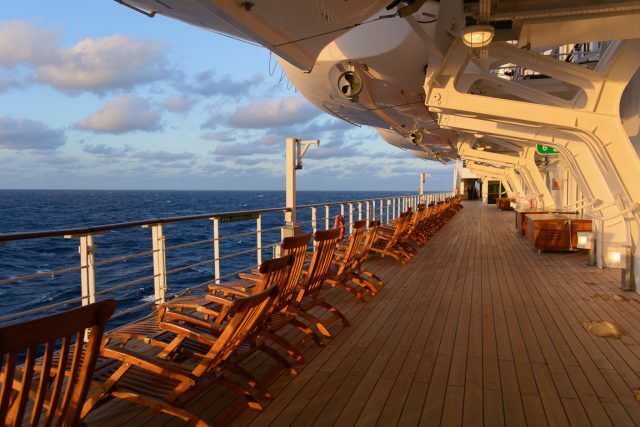 For much of the year, Queen Mary 2 earns her keep sailing seven-day transatlantic voyages between Southampton, England and Brooklyn, New York. But you can also find Queen Mary 2 sailing to the Mediterranean, the Baltics, the British Isles, Canada & New England, and the Caribbean. Fans of longer voyages will be delighted to know that Queen Mary 2 sets sail on a World Cruise each and every January, and those who want to see her seakeeping abilities firsthand would do well to book one of Cunard’s famous “Winter Transatlantic Crossings” that take place in November, December and January. The late maritime author John Maxtone-Graham once coined the phrase, “the only way to cross” – and that’s very applicable for Queen Mary 2, the ship that will want to make you hang up your plane tickets and sail the deep blue seas between continents forever. Carrying 2,592 passengers double occupancy, QM2’s cabins are split into two groups, the Princess and Queens Grill class staterooms (the top being the huge Grand Duplex Suites, all with private dining rooms, lounges and deck space) and the Britannia category, which comprises everything else, from cozy 159-square-foot insides on up to the roomy, 248-square-foot deluxe balcony cabins. The Junior Suites, also known as the Princess Grill suites, are especially appealing with their huge bathroom with tub, walk-in closet, sitting area, and big balcony. 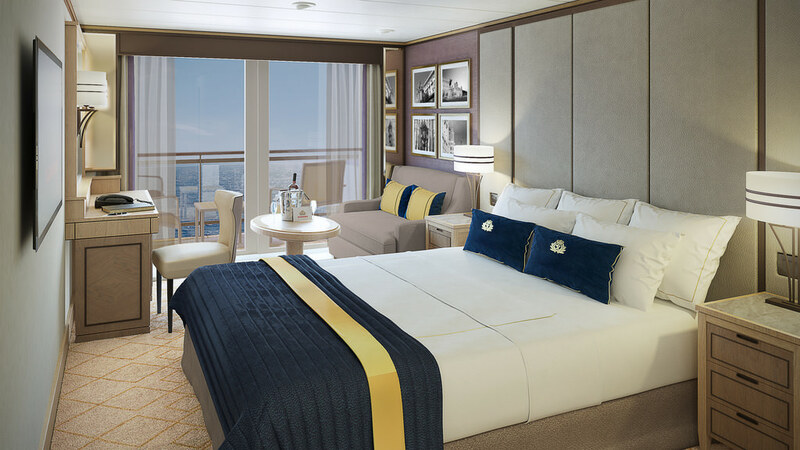 In the Queen’s Grill suite class are the ultimate indulgence: two-story penthouse suites overlooking the ship’s stern. 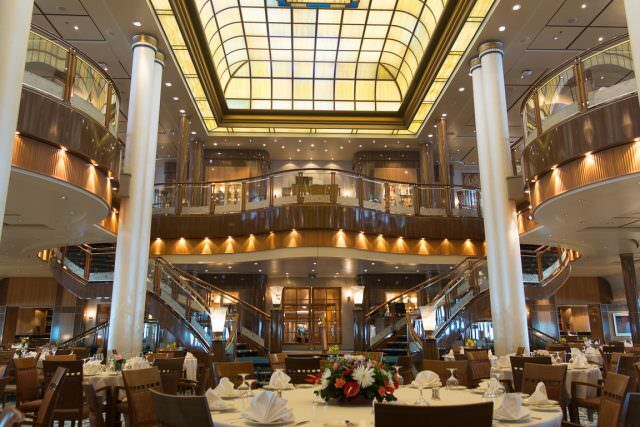 On this ship, the category of stateroom you book will determine where you dine. Guests booked in Britannia class staterooms dine in the grand and opulent Britannia Dining Room, which is open for breakfast and lunch in an open-seating environment, or for dinner, with fixed early and late sittings. Early Seating (typically around 6pm) is the most popular by far, but we prefer the late seating (8:30pm) for its relaxed, non-rushed qualities. Guests booked in Princess Grill or Queens Grill suites each have their own dedicated, private restaurants tucked away at the stern on Deck 7. These offer open seating dining for breakfast, lunch and dinner, along with a more intimate atmosphere and different menus. 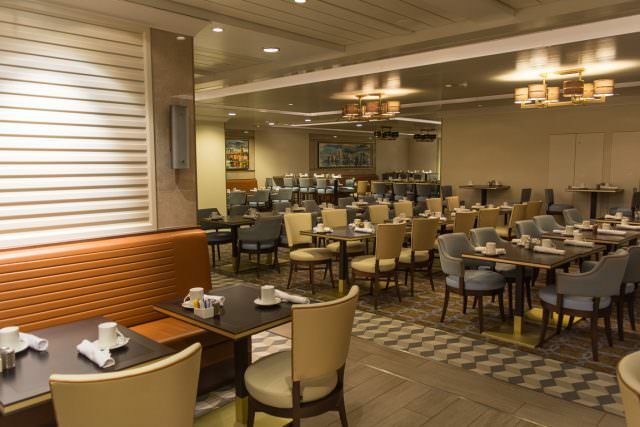 During Queen Mary 2’s 2016 refit, the casual King’s Court Buffet received a substantial makeover that significantly improved its decor and passenger flow. We’re sad to see the glass elevators (that used to run all the way down to the lower level of the atrium) go, but we don’t miss the awkward bottleneck they created in the middle of this casual dining venue. For those who want the ultimate in English tradition, you’ll want to head down to the Golden Lion Pub on Deck 2 for Pub Lunch. Get there early: Seats at this popular (and complimentary) venue go fast once passengers discover how good the Fish & Chips are. 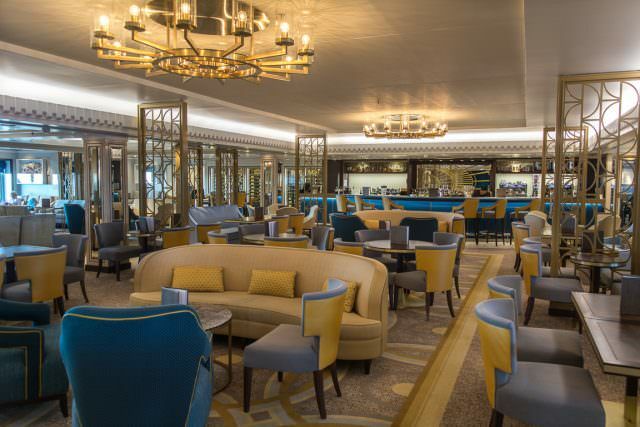 Since QM2 was designed for comfortable cruising even in rough seas, the majority of QM2’s many public areas set down on Decks 2 and 3, including the elegant Empire Casino, intimate Gold Lion Pub and the stunning Chart Room. Its high ceilings and green-glass deco wall maps are beautifully retro. The Illuminations planetarium is a one-of-kind place to see 3-D films about astronomy and space, while dancers should head to the Queens Room ballroom, with a high arched ceiling and crystal chandeliers. 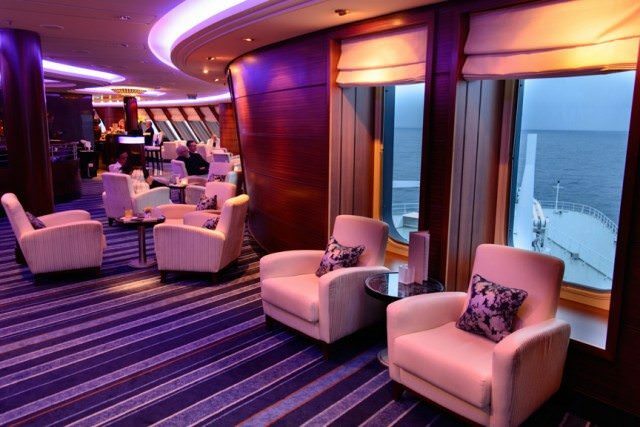 Up on Deck 9 you’ll find one of the best spots for a drink and good views in the bow-facing Commodore Club. The two-story Canyon Ranch Spa is popular, for both its range of treatments and aqua-therapy pool. 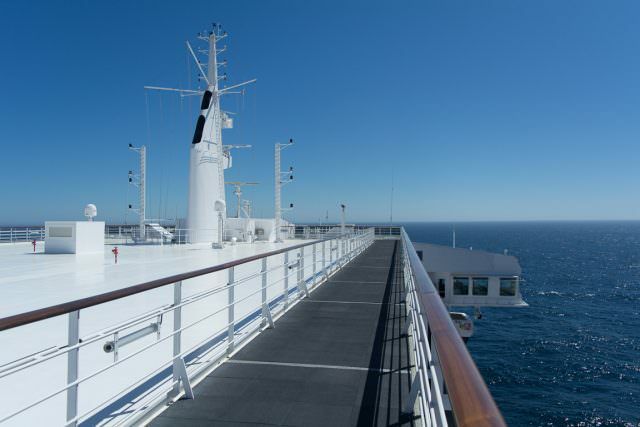 Besides the well-stocked gym, many passengers love a long walk around the ship’s lovely traditional outdoor Promenade Deck to soak up the views and sea breezes (three times around equals one mile). Other diversions include a pair of gold simulators, pools, ping-pong, paddle-tennis and more. 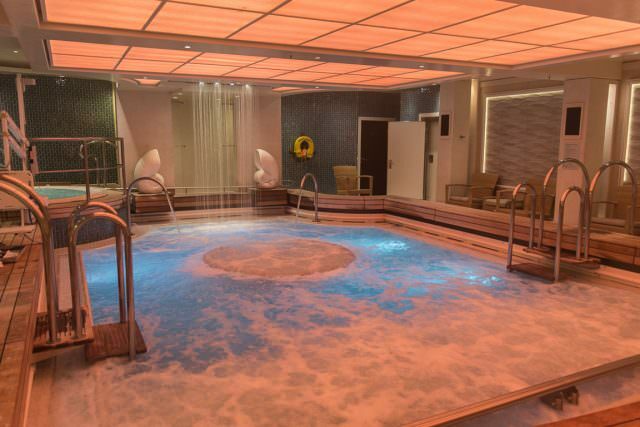 Cunard announced a range of enhancements that were made to accommodate the changing needs of its core passenger base aboard Queen Mary 2, and one of these focused on solo travellers. The ship was refitted with 15 staterooms designed specifically for solo travellers, which will became the first dedicated solo accommodations aboard Queen Mary 2. 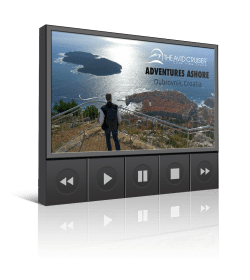 The line noted that these solo rooms were designed to better serve the increased number of guests choosing to sail alone, as well as to those travelling as part of a multi-generational family. Refitting a Queen: the first solo traveller staterooms were added to Queen Mary 2 in 2016. 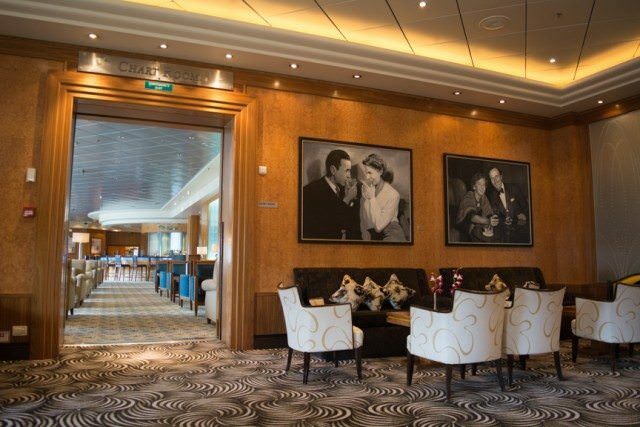 Shown in the illustration, these staterooms occupy the former Images Photo Gallery on Deck 3L port side. 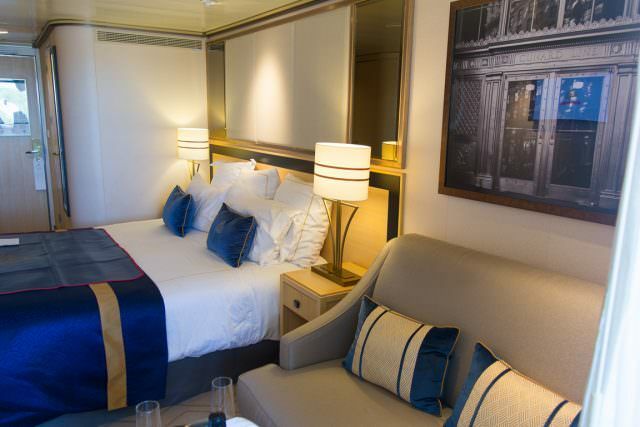 Known as Category KB and KC, these solo oceanview staterooms occupy some interesting areas of the ship. 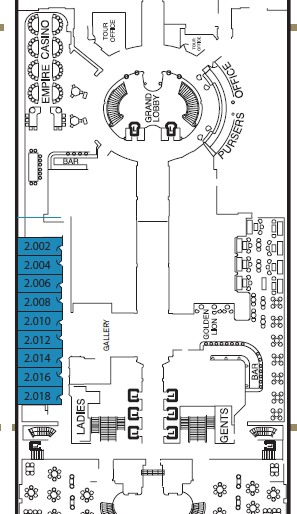 Nine Category KB staterooms were installed on Deck 2, in the area formerly occupied by the Empire Casino’s slot machines. Thesewere relocated to the forward part of the Empire Casino, adjacent to the Grand Lobby. We can see why Cunard chose that area: The Casino, even in the evenings, is far too big on this ship for the relatively small number of guests that use it. 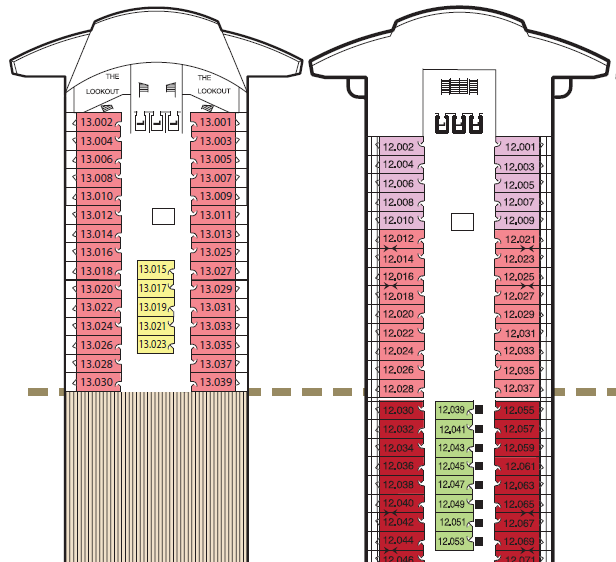 Additional Category KB solo staterooms take up space currently occupied by the Empire Casino on Deck 2. 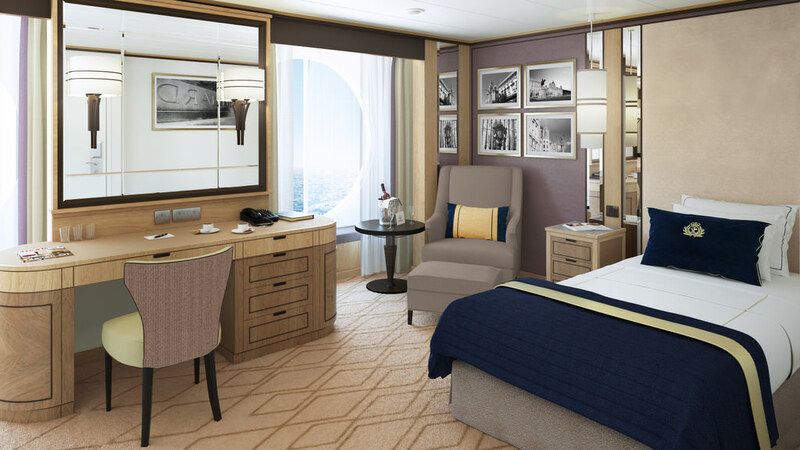 Solos can also select one of six Category KC oceanview staterooms on Deck 3L, the so-called “tween deck” that functions as a pass-through to access the Queen’s Room without having to go through the Britannia Dining Room. This space used to house Images Photo Gallery, whichwas relocated across the hall from the Golden Lion Pub on Deck 2. 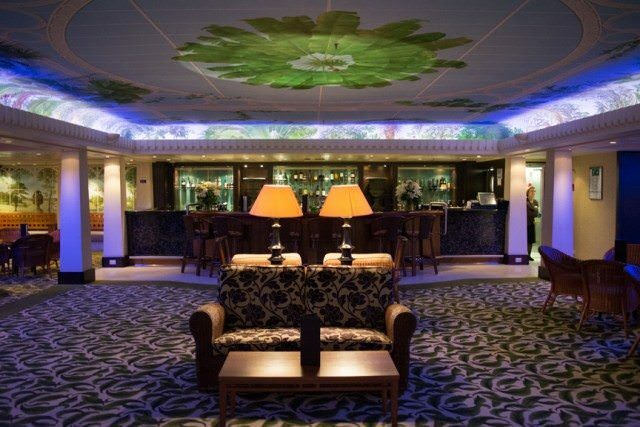 Britannia Club Balcony staterooms were added to Deck 13, and all will receive new decor. Rendering courtesy of Cunard. Cunard is also increasing the number of Britannia Club Balcony staterooms aboard Queen Mary 2 with the installation of 30 new Category A2 staterooms on Deck 13, marking the first time accommodations have been featured on Deck 13 of this ship. They took the place of the rarely-used Splash Pool and Regatta Bar, both of which were removed. Ranging from 242 square feet to 248 square feet, these rooms let guests dine in the more intimate Britannia Club Restaurant, which is situated adjacent to the main Britannia Dining Room. 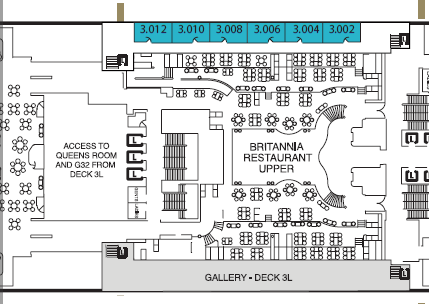 Guests have assigned tables, but may come as they wish between 6:30 p.m. and 9:30 p.m.
New Britannia Club Balcony staterooms are coming to Deck 13, shown at left, while some changes are afoot for Deck 12, right. The line also refreshed the décor of current and new Britannia Club Balcony Staterooms. Colors include a nautical palate of blues that is designed to soothe and entice travellers to linger in their midrange accommodations. 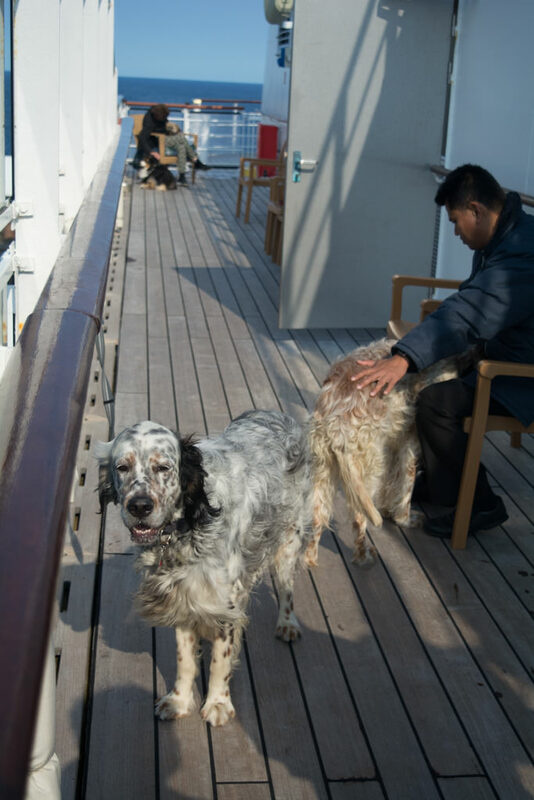 Humans aren’t the only beneficiaries of the extended 2016 drydock: A total of 10 new kennels were added to Queen Mary 2’s uppermost deck, expanding the total number to 22 from 12. Both dogs and cats can sail on Transatlantic Crossings, and kennels sell out well in advance, according to Cunard. The kennel refurbishment includes a new inside play area, a larger outdoor walking area for the pets, and an enhanced Owner’s Lounge. Cunard also installed a lamp post and a fire hydrant inside the dog walking area; features that were included originally aboard Queen Elizabeth 2 and originate from suggestions made by the Duke of Windsor. Located forward on Deck 7 just aft of the Canyon Ranch Spa, the Winter Garden was perhaps one of the most baffling public rooms aboard Queen Mary 2. It was one of our favorites, but we appear to be alone in that regard, as the room remained largely empty and under-used, save for the occasional spa lecture. 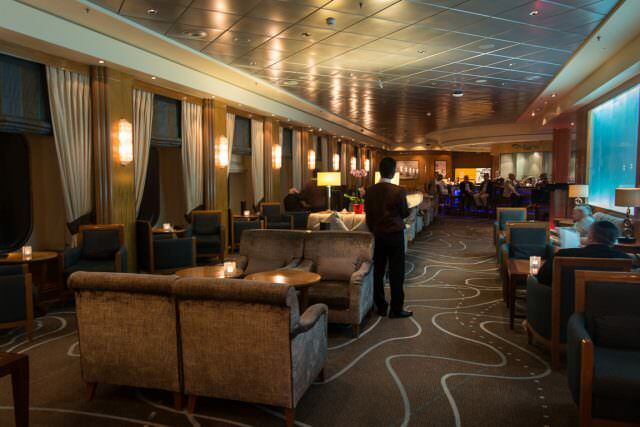 Cunard seem to have realized this, having announced plans to dramatically transform the lounge for the better. 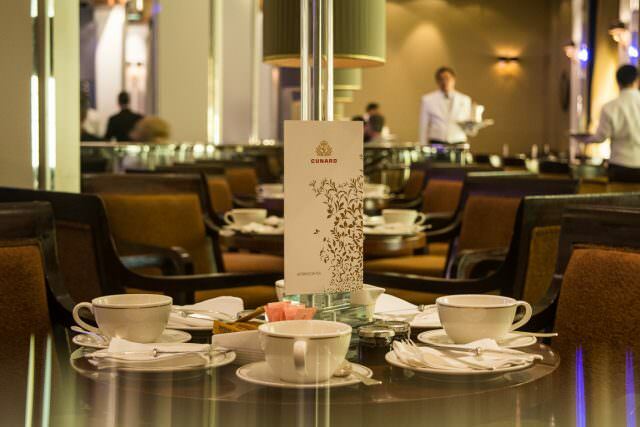 The new Carinthia Lounge will feature a dedicated patisserie and an afternoon tea service, with the option of a special Veuve Cliquot Champagne Afternoon Tea experience (this used to be held in the Veuve Cliquot Champagne Bar on Deck 3). When the sun sets, the Carinthia Lounge turns into an inviting evening spot with premium wine, small plates and relaxed entertainment. If there was one space that seemed to have always been problematic aboard Queen Mary 2, it was the King’s Court Buffet on Deck 7. Queen Mary 2’s casual eatery suffered from a lack of window seats and a disjointed layout that made it difficult to navigate, even after repeated crossings. But no more: Cunard is re-doing the entire area with new décor and what it promises will be an “interactive experience,” featuring rethought food stations and galley options. In fact, Cunard spent 18 months carefully redesigning the King’s Court from the ground-up, and the results look beautiful. While the general arrangement plan stays largely the same, there are a host of new features like pre-set tables and waiter-served drinks. 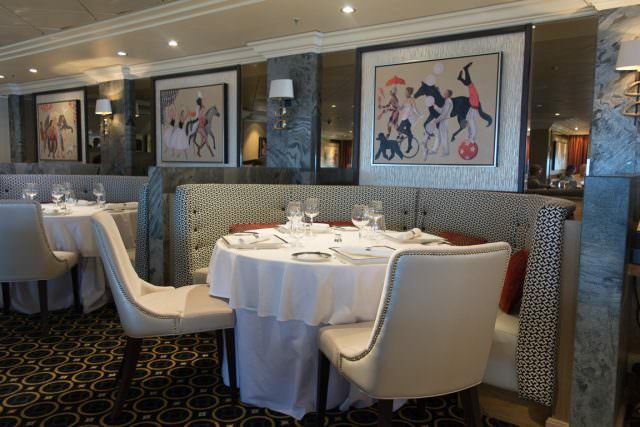 Also changing is Todd English, Cunard’s specialty restaurant located on Deck 8 aft. Rebranded as The Veranda, a favorite among guests onboard Cunard’s Queen Elizabeth and Queen Victoria, this remastered dining venue will evoke the special personality and flavor of French regional cooking with seasonal influences, while still maintaining the unique viewpoint overlooking the ship’s stern decks. The refit will also spruce up existing passenger areas, and will include regularly-scheduled technical maintenance like the repainting of the hull and the inspection and cleaning of the ship’s four Rolls-Royce “Mermaid” propulsion units. Queen Mary 2’s last large-scale refurbishment occurred in 2012.